While Garrosh Hellscream has been promoting his platform of the Horde dominance across all of Azeroth, the other camps have been scrambling to get their own campaign advertisements out in order to match him. Word has it that it Thrall has been focus testing a number of slogans that would match Garrosh’s appeal to the Horde’s sense of honor but also invoke the message of peace. This profound message invokes a number of images. Yes, we must cook our food in order to survive. Yes, even the simple cooks deserve a place in this newest Horde. Yes! We must show Care Over Other Koncerns! Well, I may be stretching that last one a bit. But it is a powerful verb to represent what I’m sure is a very powerful campaign. However, when I took the time to show the new ad around the Undercity to ask about what the Forsaken thought of Basic Campfire’s new message, I found a very different tune that what I had been hearing in Kalimdior. For the most part the Forsaken found the ad absolutely offensive. Saying that cooking denoted eating, and that since the Forsaken aren’t alive – Well they don’t really have to eat. They do eat, but they don’t have to. Except for the ones without lower jaws. They’re upset because they can’t even eat if they wanted to. But it seems it’s not in the interest of Basic Campfire’s political career to remind the undead of these things. In order to see if there were some kind of consensus about this from the formerly-living, I decided to ask the Knights of the Ebon Blade what they thought of the campaign. They were not offended. They simply laughed at me and asked if we were really considering electing a couple of logs that have been set on fire as a warchief. After explaining the other candidates to them, Highlord Darion Mograine himself pledged his support for Basic Campfire. So I guess not all undead are resurrected equal. That’s all from the Warchief Election News Headquarters here at Oddcraft. Your regularly scheduled Stormwind Tour should be up soon. Lok’tar Ogar and have a nice day. Posted on June 11, 2010, in Warchief Election 2010 and tagged basic campfire, death knight, forsaken, knights of the ebon blade, undead, warchief election. Bookmark the permalink. 13 Comments. 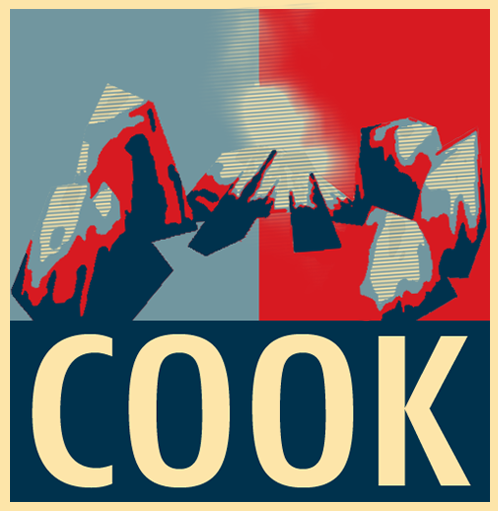 I find the simple message of ‘Cook’ a refreshing alternative to the warmongering of Garrosh. After all, if instead of making war, we made delicious soufflé, Azeroth would be a better place. Love love love this. finally getting around to linking out to it from the blog today. Plan to include this image (credited and linked back to here) b/c I love it. My guildies, who have long been a part of the Basic Campfire for warchief underground movement, will be thrilled that are likeminded citizens out there. There is amazing love out there for Basic Campfire. 😀 It’ll be interesting to see how the numbers come out in a few months when I run the election. Blizzard said that they will remove all buffs that grant spirit and kings/mark of Wild no longer give spirit. What will happen to Basic Campfire?! Basic Campfire is attempting to not be pigeon holed as the healer’s candidate. He’s dropping the spirit buff so that he will appeal to a larger audience!